The Pelagic Cormorant is a small, slender cormorant of the Pacific Coast. Although it is exclusively marine in habits, its name is misleading, since it prefers inshore areas rather than the open ocean. The Pelagic Cormorant uses its own guano to solidify its nest materials and to cement its nest to the cliff face. The Pelagic Cormorant is among the least gregarious or social of the cormorants, nesting on steep cliffs along rocky and exposed shorelines, either in loose colonies or far from nearest neighbors. 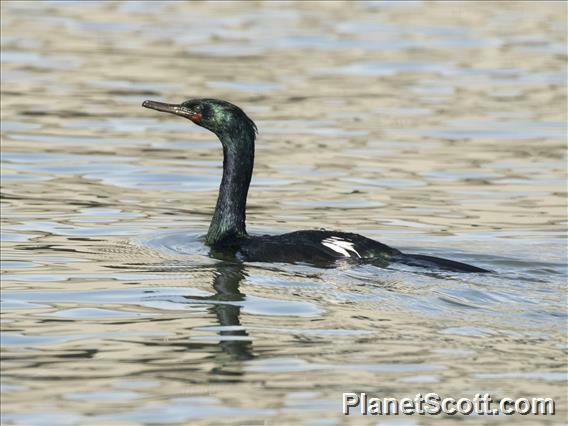 Bibliographic Citation: "Pelagic Cormorant (Phalacrocorax pelagicus)." The Cornell Lab or Ornithology All About Birds. Citation Link Accessed 27 Jan 2014.